After a brief scare for a Brooklyn congregation, a rabbi's stolen vehicle containing sacred scriptures valued at $30,000 was recovered unharmed. A torah worth $30,000 was stolen along with a Brooklyn rabbi’s 2007 Toyota Corolla on Friday in Flatbush. Remarkably, the Toyota and the torah were recovered on Monday afternoon, according to police. Rabbi Binyamin Tamaiev was holding a regular service at the Congregation Agudath Sholom of Flatbush on 18th Avenue when the theft occurred. Police are not sure if the thief was aware of the Torah and several pairs of prayer phylacteries, small leather boxes worn on the head and arm that contain verses from the Torah, that were within the vehicle, but members of the congregation were reportedly heartbroken at the loss. Tamaiev repairs Torahs and other holy scriptures, and had just completed repairs on the holy scripture owned by another congregation. It was reported that Tamaiev was planning to place the Torah and scriptures in a locked safe within the synagogue, but he was running late and left them in his car. Congregants reported that they believe the thief entered the synagogue during the service where he also stole money from charity boxes and Tamaiev’s keys. The car was not discovered stolen until Sabbath was over, when driving is permitted. The vehicle was recovered after an anonymous tip was phoned into the Misaskim Organization’s 24-hour emergency line. The advocacy group which typically provides support and assistance to local Jewish enclaves immediately reported the tip to the NYPD’s 66th Precinct which was investigating the case. The car was recovered from East 10th Street, between Avenue I and a dead end, exactly as the tipster reported. Police are continuing their investigation, but the Torah is safe. 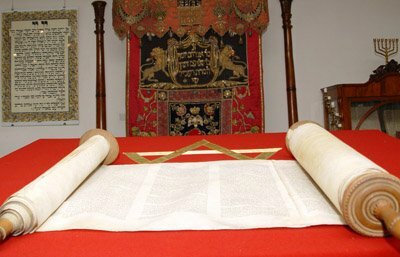 “The speedy recovery of this sacred scroll is a testimony to our ability to work together,” Assemblyman Dov Hikind said in a statement, announcing that all invested parties would sleep more soundly knowing the Torah was unharmed. Subject: LongIsland.com - Your Name sent you Article details of "Torah Worth $30,000 Recovered Along With Stolen Car"